Players and coaches will enjoy these very cool Personalized baseball keychains bulk! With bulk pricing, customizing these keychains is a hit! Create an affordable keepsake with your Team Name, Year, some can even be customized with your Team Color! Great for fans, players, gifts, and favors! 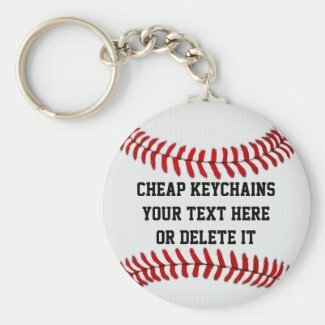 Buy Personalized Baseball Keychains Bulk with Your Text! 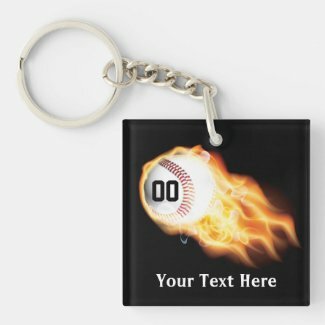 These really Cool and unique Baseball Keychains bulk are customizable with your NAME, JERSEY NUMBER, YEAR, TEAM NAME, and even the background COLOR! Home Run! 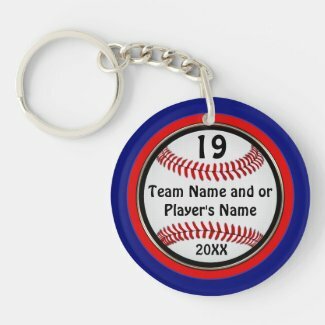 Vintage Dirty Personalized Baseball Keychains in Bulk for your Team Players! 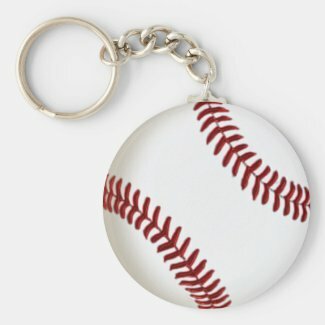 Baseball keychains bulk or No Minimum Order! Your Team’s Highlights or Stats, winner of Championship or individual Team Player’s Numbers! It’s in your zone! These are very cool gifts for Graduating Seniors or Coaches, too! 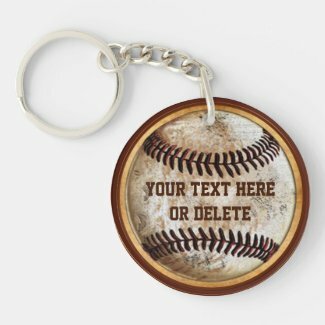 This Vintage Style Square or Round Dirty Baseball keychains bulk capture the Americana of Baseball! Of course, no minimum order, and bulk pricing for these classy gifts! Classics! Team Spirit! Our baseball keychains bulk Say Congratulations for a great year to winning a State Championship! Name the YEAR, TEAM, SCHOOL, and even Team or School Colors for the keychain on the right! What a way to celebrate the Spirit of a great year with these baseball keychains bulk! Baseball Keychains Bulk Pricing for all of the Above Customizable Baseball Keychains! CLICK ON the two Koozies above, to personalize with your stats! A great gift for that special player or fan! Please call Bev, 239-949-9090 if you should need help or would like to request a customized order! No extra charge for customizing or personalizing! Zazzle is one of the finest companies for reproducing artwork and graphics and photographs. They offer state of the art printing and have the customer satisfaction to prove it! 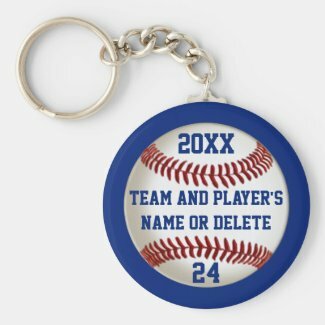 Many of our products at our Zazzle store can be customized with team or individual photos, in addition to our baseball keychains bulk. The cutest I’ve seen is a youngster with medals around her neck after a season of hard work and hustling and plenty of team spirit. Go team Spirit! The Miracle League of Baseball! What a wonderful coming together, celebrating the sport of baseball on the level that reaches children with challenges, and teaches us in a way that nothing else can! Batter up! Oh, for the joy of a child up at bat, in the spotlight, their name called on the loud speaker as they come up, ready for the thrill of hitting the yellow ball! If tears don’t come as your heart melts at the sight of a child who may never run ~ or in some cases, even walk, comes up to bat, then give it time…and you might as well get the tissues! A child’s face lights up, his smile takes over, letting you know that something magic is about to happen. Hands grasp the bat…the moment is about to come as they look for that special bright spot that will take them to places out of their world. What an amazing impact, viewing both videos, as you witness patience, team work, hard work, and the coordination of coaches and managers to make all this happen, all for this moment, when a child gets to step up and change his or her world, perhaps forever. All it takes is one hit and Heaven has scored! The sky is the limit, as these kids and their parents soar to new heights as their little angels actually put on their wings on right in front of them…and fly! What blessings these volunteers and staff of this organization, Miracle League of the Triangle, (be sure to watch their video! ), the parents, and the little Miracle Leaguers full of heart and spirit give to all of us! I encourage you to learn more about this organization. Find a local chapter…or better yet, start one! Watch for more info on The Miracle League! With great people who have such heart, what a wonderful world we live in! How many stitches are on a baseball? Well, even more impressive than the Number of Stitches is the fact that they are all sewn by HAND! Wow! 108 threads or 216 double stitches are on each and every baseball. If you count them and come up two or four short, that is because two are always hidden…so we will take their word for it! And the glove is off to the folks in China, who hand sew about 80% of them! Whew! I need a fan just thinking about that! Many thanks to Coach JP’s Clubhouse Blog! I like this! Who hasn’t cringed at the thought, much less sight, of a parent yelling at anyone and everyone who gets in the way of the success of their child? Hopefully, not many disagree that the game is for the Little Leaguer, not the red faced parent shouting angry words or just being loud and obnoxious! Who doesn’t want to see their child benefit from the aspects of sportsmanship and becoming a team player wherever they are, throughout their life? It would do us all good to take a solid look at just what may get in the way of all the effort you and your child are putting forth in those Little League games. Give a second thought to those extra yells and red faces, especially if they are aimed at the coaches or umpires ~ Ugh! Thanks to the eyeopening thoughts of Mike Matheny at The Matheny Manifesto, I am applauding his directives for returning the game to its original intent…benefiting the kids beyond the four bases and the ball field. And the quieter the better! Arrive to practice on time, neat and with all their equipment and shirts tucked in and hats on straight ~ and no baggy britches! How can they run with their pants falling down?! Allow them to play the game without any assistance from you…that thoughts carries a lot of weight, in a lot of ways! Your child should hustle and run out balls, regardless of talent, everyone can take an active role and be a player…how else will they improve? And last but not least, According to Mike, Their attitude, concentration and effort add up to more than just three things…it could very well make the total package of a team player for life. Thanks, Mike Matheny for your Manifesto…I think you’re right on base! Exciting changes to the world of Baseball! In an effort to recapture a captive audience, Major League Baseball has instilled new rules to hopefully bring us back to the edge of our seat during a game. I say this is a right step in the right direction. Now the batters are up against more than a strike if they disobey a new rule in place, that is, stepping outside the batter’s box while at bat. No more wandering off, spitting and thinking, looking and scratching ~ now they must get down to business and act like they want to play the game! It’s no sport to stall ball and kill time while the clock is ticking. Of course, there are a few exceptions for things that happen as the ball is in play, such as fouls and being brushed by a ball, and wild pitches. But everyone should be glad to see the batter is basically paying attention and not off to the side killing our time and interest in the game. Alas, the half inning breaks will be timed, so no more side knitting unless you can do it in 2 minutes and 25 seconds for local games, or 2 minutes and 45 seconds for national televised games. Two timers are ticking to serve as a reminder why the boys are here. Pitchers who don’t complete their warm up before the timer is down to the 30 second mark forfeit their right to do so. They are supposed to be on the mound, ready to groove, not stuck in a groove. If pitching changes are going to be made, they will be timed as well. No one is more front and center than a baseball pitcher! Managers are encouraged to verbally call or use a hand signal from the dugout to challenge a play, a win-win that keeps the ball moving with less down time. And if I’m interpreting the rules right, coaches are entitled to one challenge per game, retaining each additional challenge, and for tie-breaker games, they will receive one additional challenge. Check out ESPN’s Major League Baseball Announce Pace of Play Rules info. They’re calling it “pace of play.” We call it not having to pay to wait. That’s a win-win, no matter how you hit it. Can you Swing a Homerun? How well do you know your baseball terms? Where are you if you’re caught in a PICKLE? Between bases! What could happen if you’re in a RHUBARB? You could be thrown out of the game ~ give yourself a time out for being in a heated argument! Why would people like you if you had MOXIE? Because you are skilled and daring ~ a winning combination! When is a BALTIMORE CHOP a good thing? When you’re the batter and you hit a high-bouncing grounder! Chop Chop! Who is a FIREMAN? Someone who will put out a fire…a relief pitcher! Where can a player SHAG? In the outfield, practicing catching! Dancin’ to CHIN MUSIC? If you receive a high inside pitch, you just might! No Smokin’! But BLOWING SMOKE is okay! Fast pitching, burning ’em up! GOPHER BALLS for the win! Pitch homeruns, and you are pitching Gophers! TEXAS LEAGUER for the win! Ball missed by two outfielders! GUNNED DOWN? You’re outta here! CLEANUP at home plate ~ Job for the batter, usually the fourth person, bring ’em home! How big is your BANDBOX? Small enough for an easy homer? When can RUBBER break a tie? When it is a RUBBER GAME! Looking for More Great Gifts for Your Sports Player or Fan? 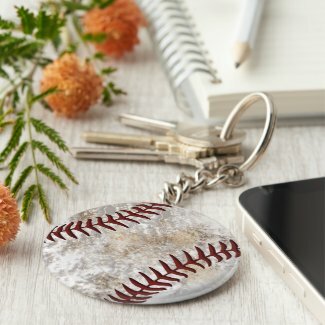 In addition to our baseball keychains bulk, check out our Collection of Sports Gifts and treasures! We specialize in unique gifts that will be treasured and memories to last a lifetime! 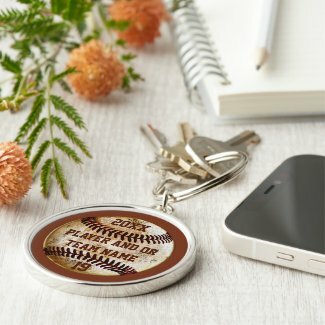 For many more unique gifts, visit our Zazzle store! Zazzle is known for its excellent printing and 100% customer satisfaction! Many of Zazzle’s products are made in the USA! We take pride in what we do! We offer personal assistance to customize your order, so you will create that special keepsake! Should you need help with anything or to request a custom order at no extra charge, please call Bev to help you, 239-949-9090.